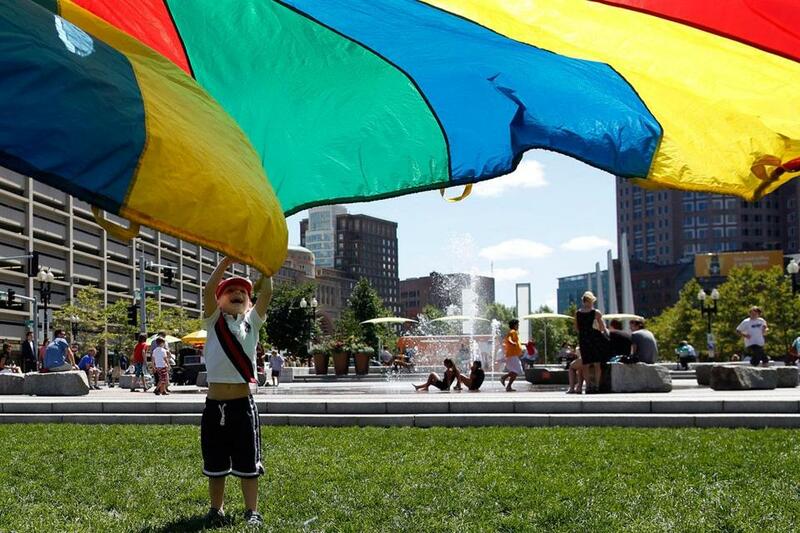 Sam Lottner played with a rainbow-colored parachute on the Rose Fitzgerald Kennedy Greenway in Boston. There is no grand Garden Under Glass, no history museum, no arts and culture center. But — wait — there are people. Five years after it opened, the Rose Fitzgerald Kennedy Greenway is attracting hundreds of thousands of visitors a year, its attendance increasing sevenfold since 2009. The park — for years maligned as a glorified median strip between downtown and the waterfront — has become something of a people’s park, a bustling urban refuge, despite its lack of major attractions. Downtown office workers line up for the food trucks slinging tacos and Vietnamese sandwiches. Young people practice yoga on the grass, or take advantage of the free Wi-Fi. Children frolic in the fountains. Tourists speaking Arabic and Portuguese pose for photos near the sculpture that billows fog. That the Greenway has been embraced by so many is a testament to the power of a patch of grass in an area dominated by concrete plazas and towering buildings. Originally envisioned as an emerald gem that would one day rank with the world’s premier urban green spaces, it has instead become a democratic haven, a place for the masses to cool off and unwind, perhaps with a cold drink and a magazine. 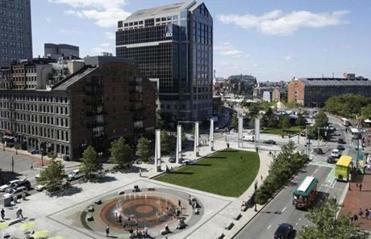 Urban planning experts may mourn that the Greenway is not yet all it could or should be. But city residents, workers, and visitors have voted, and they like it. On Wednesday evening, in the stretch of park across from the North End, three women sat at a café table, swapping stories about their grandchildren. They said they chat there most nights until 10 p.m., and would stay longer but the park staff chain up the chairs. Two brothers, ages 7 and 11, devoured cake and cannoli from a nearby bakery, a sweet reward before their mother took them to the Museum of Fine Arts. Twenty-somethings in workout gear did knee bends, warming up for a free CrossFit class. At the Rings Fountain across from the New England Aquarium, Donnah Cole, 48, of Piscataway, N.J., who was in town for her husband’s business trip, rested on a stone bench while her daughter, Danielle, 8, pranced through giant jets of water, laughing. The placid scene was hard to imagine just a decade ago when the Greenway was a rocky construction site, surrounded by Jersey barriers and chain-link fencing, and littered with backhoes, trash barrels, and orange cones. Mike Laurin, 37, a litigation support worker, has watched the parks evolve from the window of his fifth-floor office on State Street. He remembers when the Greenway — a 1½-mile ribbon of parks that stretches from North Station to Chinatown — was no more than “dirt piles,” and before that, the elevated Central Artery. Now, he heads there for lunch almost every day. “Every year, it seems like more people coming, making use of the grass, sitting on the benches, walking,” he said. 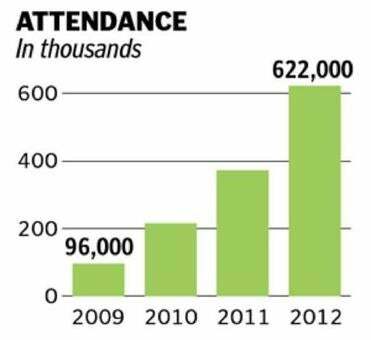 Attendance has increased dramatically, from 96,000 in 2009, to 215,000 in 2010, to 372,000 in 2011, and 622,000 last year. Those figures reflect the number of food vendor patrons, Wi-Fi log-ons, carousel riders, and visitors to events, and do not include the thousands who just plop on the benches or lounge in the sun. The park has benefited from the revitalization of the waterfront. Visitors stop by on their way to the Harbor Islands. And nearby restaurants, once inward-looking, now feature windows that face the Greenway, offering seared salmon with a view. On Aug. 31 a new carousel will open, replacing the rented one that has been a draw for the last four years. More public art is planned in the years ahead. Some urban designers remain critical, saying it has not lived up to the majestic promises that city and state officials made two decades ago when they first pitched the Greenway as a replacement for the elevated highway. Back then, officials conjured images of an iconic urban destination, like The High Line in New York or Las Ramblas in Barcelona. But years of budget problems, design disagreements, and management fights forced the park to scale back some of its early ambition. These days it is on more solid footing, with a $4 million annual budget and a $13 million endowment. Still, 50 percent of the park is hard surface, and the land is broken up by highway ramps and cross streets. But people who live in and around the city gravitate toward the parks just the same. On Wednesday, in the park by the North End, Michael Pease, a 25-year-old paralegal who works in Government Center, kicked off his loafers, sipped iced coffee, and read a David Foster Wallace novel. He comes to the park almost every day. “It’s a little bit of green in the city, a place to get away from the concrete and the buildings,” he said. Across the park, Brandi Diaz, a 20-year-old MassArt student, was lying on her back on the grass, eyes closed and shoes off, decompressing after a job interview. Michael Levenson can be reached at mlevenson@globe. com. Follow him on Twitter @mlevenson.